Some parents of quake student victims have received letters of condolence and consolation money from Chinese authorities. Consolation money of 32,000 yuan (approx US$4,633) will be paid in installments. A relative of a student victim told a reporter that many parents who lost their children did not take this payment, because they could not care less about the money. They hope to hold the Chinese regime accountable through legal channels. When I asked Mr. Zheng how the relatives of student victims react to the regime's actions, Mr. Zheng said that many parents could not care less about this money and would continue the lawsuit. Mr. Zheng mentioned that on June 2, some parents of student victims and several Japanese reporters went to appeal in court, but the Japanese reporters were expelled, and the parents were “interviewed” by the police. These parents had been released, he added. The four-storey building of the Dujiangyan Xinjian Primary School collapsed in the earthquake, killing over 240 teachers and students. According to the official figures, over 200 teachers and students also died at the Juyuan Middle School in the city, but parents say the death toll could be as high as 500. Shi Zhenghong, resident of Shifang City, another heavily hit area in the quake, lost his only child, 9-year-old daughter Shi Yue. 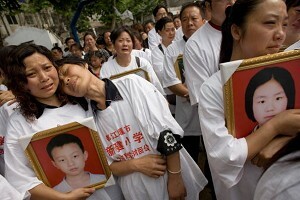 Shi Yue was buried under the collapsed premises of the Bayi Elementary School. Shi Zhenghong said that they had received student life insurance from the insurance company and consolation money from the government. Shi said that they do not know how much consolation money the communist authorities will give in the end, and nobody told them whether the regime would give more consolation money in addition to the 5,000 yuan they have received. Shi feels that this amount is too small. Now the regime seems to have begun tightening its control over the protest activities held by the victims' relatives. Mr. Zheng from Dujiangyan said that the ruins of the Juyuan Middle School and the Xinjian Primary School had all been blocked by the army, and that parents and reporters cannot get in. It has been reported that the Chengdu City Department of Family Planning stipulated that the parents of only-child victims will each receive a pension of 100 yuan ($14.48) per month.